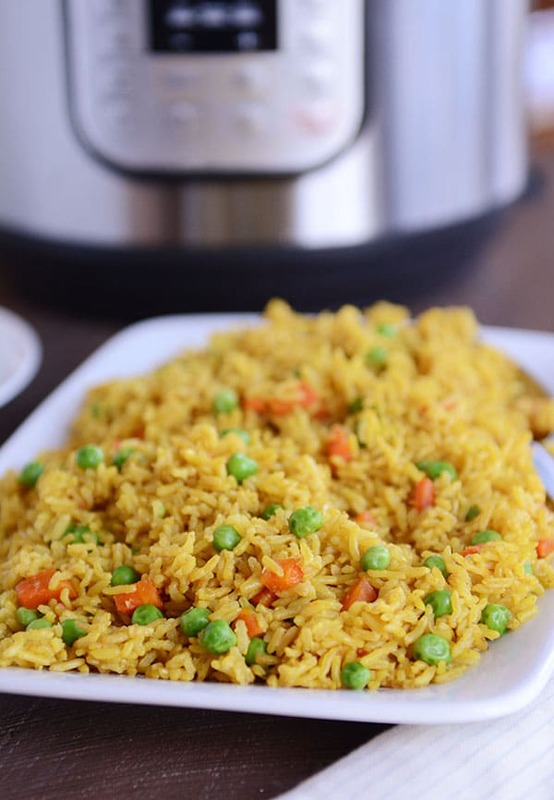 Healthy, inexpensive, and delicious, this pressure cooker Indian Vegetable Rice is a perfect side OR main dish, and thanks to the almighty Instant Pot, it is easy as can be! 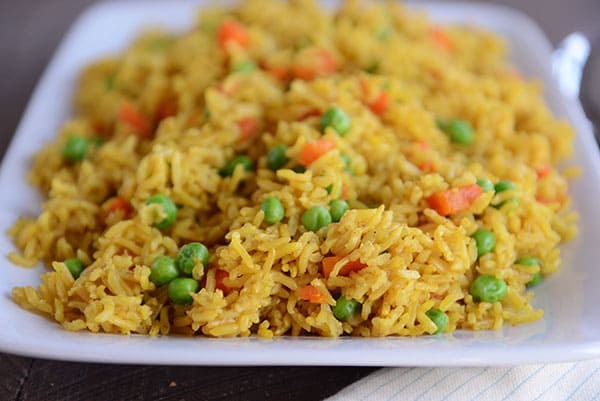 I’m a huge fan of this Indian Vegetable Rice. Not only is it healthy and extremely tasty, but it is ridiculously easy. Over the last year or so, I’ve transitioned from making rice on the stovetop to almost exclusively making all the rice we eat in the Instant Pot. Using the IP is fast and hands-off and makes perfect rice every time. But most of the time, this is me around 4:47 p.m.: frantically throwing handfuls of rice in the Instant Pot, adding broth or water, sealing the lid, and letting it go (while I most likely finish piano lessons with the kids or run someone to a soccer practice). My general rice ratio for the Instant Pot (be it white or brown rice) is 1 cup of rice to 1 1/4 cups liquid. I add a pinch of salt and usually use low-sodium chicken broth for the water, and that’s about it. Nothing terribly fancy, as you can tell, but it does the job for rice that’s going to get smothered with stroganoff or Indian butter chicken or red beans chicken sausage. Sometimes, though, a deliciously quick and tasty rice dish that can stand on its own (no gravy or sauce needed!) 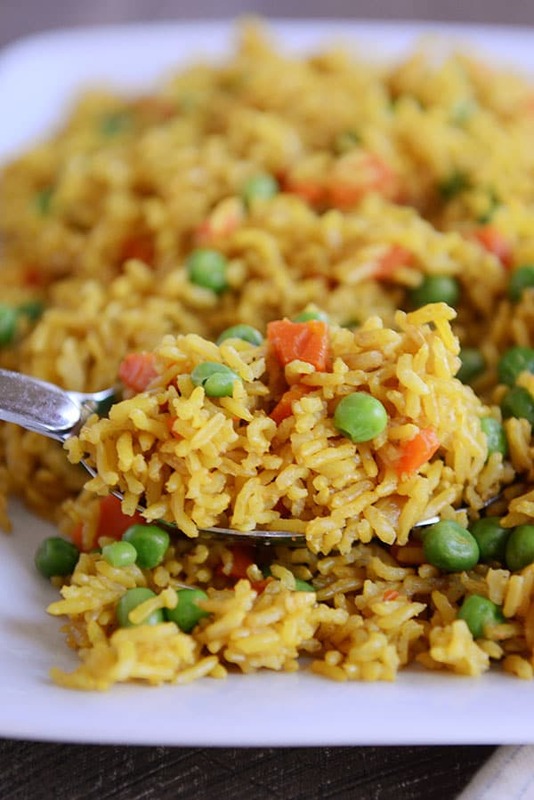 like this Indian Vegetable Rice can really make one feel like a rock star. And on a week where I’ve been feeling a little insecure and doubtful and failure-ish with many things in my life, I’m embracing the fact that Instant Pot Indian Vegetable Rice can make me feel kind of awesome. Even if it’s a temporary awesomeness lasting only until the final spoonful of rice is gobbled up, I’ll take it. 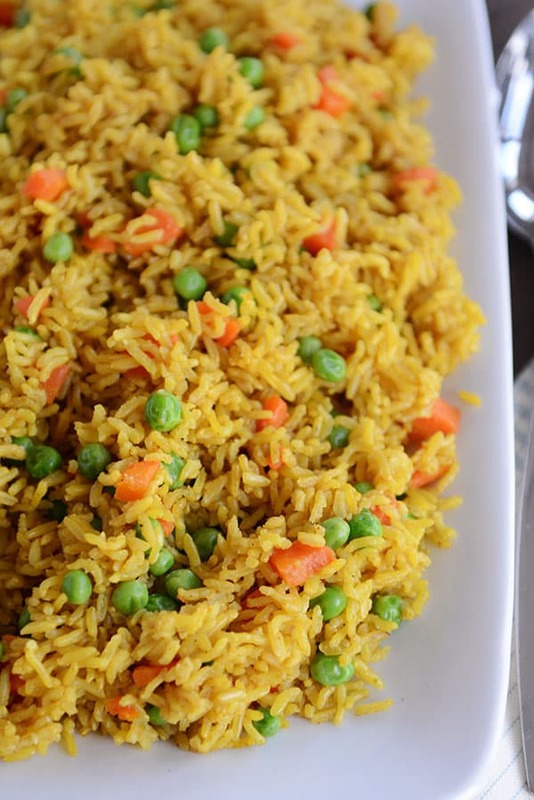 This Indian vegetable rice is one of those dishes where the yummy factor comes largely from it’s simplicity. Simple, every day ingredients are tossed into the Instant Pot, and a little over 30 minutes later, you have a wonderfully healthful side (or main) dish staring you in the face! I use brown basmati rice in this recipe, but you could definitely use long grain brown rice OR sub in long grain white or white basmati rice (just make sure to read the notes of the recipe, because the cooking time is drastically different for white rice vs brown rice). My favorite brand of curry powder (I’m a broken record about this, I know) is the Sweet Curry Powder from Penzey’s Spices. Best ever. But if you don’t have it, no worries. You can use any brand of curry powder here as long as it’s a flavor you love, of course. Lately, I’ve been making this Indian Vegetable Rice in the Instant Pot almost every time we have grilled chicken (particularly delicious with the coconut milk grilled chicken I posted last week) or grilled pork chops. It is such a tasty side dish! It will elevate your side dish game without hardly any effort on your part, and it will get a few extra veggies in your (and your kids’) diet. I can’t be mad about that. Heat the olive oil using the Saute function of the Instant Pot (or other electric pressure cooker; can also use a stovetop pressure cooker). Add the onion and cook for 1-2 minutes, until the edges start to turn translucent. Add the garlic and rice. Stir and cook for another 30 seconds or so. Add the carrots, salt, curry powder and chicken broth. Stir to combine. Secure the lid and cook on high pressure for 22 minutes (select Manual and then dial up or down to get to the correctly number of minutes; the IP will start on it's own). Let the pressure naturally release (or if you are in a hurry, let it naturally release for 10 minutes and then quick release the rest of the pressure). Fluff the rice. Add the peas and give a little toss/stir action to combine. Season to taste with salt and pepper, if needed. Ah, curry powder. I talk about it a lot on every recipe I post using it. As a recap, my favorite brand of curry powder is the Sweet Curry Powder from Penzey's spices. I buy it in bulk, and it is what I use in this recipe. It is a yellow curry powder, and it is not spicy. If you are using a spicier version of curry powder (every brand is different! ), adjust the amount in the recipe to taste. You could definitely use white rice instead of brown. If doing so, make sure the carrots are chopped very small since the cooking time is much shorter (maybe even consider adding potatoes, too, which don't fare well with the longer cooking time of the brown rice). All other quantities can stay the same, but the white rice only needs to cook for about 4 minutes on high pressure. Because canned vegetables are so much softer, I’d probably just stir them into the hot rice at the end. thanks! do i still use 2 cups broth if i just put the canned veggies in in the end? Hey Mike, I’d suggest using maybe 1/4 cup more water and adding 2-3 extra minutes and see if that helps! Glad you enjoyed it! Awesome recipe. Used white basmati, added potatoes and carrots for 4 minutes and added frozen peas at the end. We loved it. Just made this in my new instant pot and it is delicious. Easy and tasty! My husband commented on the second night of having this rice “this rice is really good!” I can’t thank you enough Mel for recommending the Instant Pot. I make so many of your recipes with it. Thanks for the comment! So happy you loved this recipe (and excited to see what else you make in your pressure cooker!). Minimum fuss and maximum flavor made this a perfect side to tandoori chicken. The whole family enjoyed it! Anyone ever tried this with quinoa or riced cauliflower? So tasty! I used white basmati rice and threw in one small diced gold potato. All of it was cooked to perfection at 4 minutes. The potato is a really excellent addition! Highly recommend. This is one of my all-time favorite recipes from your site. I hadn’t made it in a long while, and now I have severe dietary restrictions. Then I remembered this recipe and it fits in with the new diet, so I am doing a happy dance!!! And so glad I read through the comments because I picked up a few ideas to enhance the dish (not that it needs it). You are a super rock star, Mel! Glad to hear that, Maria. Thank you! I don’t have curry powder and really want to try this. Can I use curry paste instead? BTW, I’m brand new here and already very excited to get started. Hey there! Yes, I think you could use curry paste – depending on the variety, it’ll change the flavor of this rice a bit (and it can sometimes be quite spicy, so keep an eye on that). This recipe is for 4-6 servings. if i want to make 15 servings- how much time would I have to increase on Instant Pot? Just by a minute or so. You throw in frozen peas and serve immediacy? I doubt it. I would think the peas go in the cooker? Can you please clarify, how many minutes do you cook in pressure cook mode. 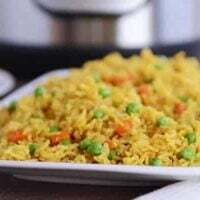 Some rice recipes with instant pot say only 4 minutes. Here it is 22 minutes. Which rice are you using here? You say cook times are drastically different for brown and white rice, however under ingredients it says white or brown rice and but directions say 22 minutes and don’t highlight a time difference. Really appreciate any comments. Thanks so much! For brown rice, I cook 22 minutes and for white rice, I cook for 4 minutes. Just made this tonight and it was delicious! I added some frozen okra with the carrots/peas with (white) basmati rice. Turned out perfect. This may be the 3rd recipe I’ve made in my new Instant Pot, and I honestly can say that it is destined to be an all time favorite. I got lazy and used frozen corn, carrot and bean mix, lightly sauted in a pan with a little bit of oil and a dusting of curry powder. Easy, fast and good. You shouldn’t have to increase the time if doubling. The mexican rice uses 8 min for two cups rice, 2c broth and 3/4c tomato sauce and comes out perfect every time. Might want to add extea liquid and double the time for a double of this recipe. This rice was really good! Excellent side dish! How can we incorporate some coconut milk into this recipe? I think that would be divine. Greetings! I just ordered an Instant Pot on Black Friday and I’d like to try your recipe but I’m a wimp in the kitchen and hate chopping vegetables. If I bought a bag of frozen (diced) carrots and peas, how do you think I’d need to adjust the recipe to cook the carrots? Any ideas? Thanks!! You might just try adding the veggies in at the beginning, although I worry they might be slightly overcooked. Either that or just try adding them in with the peas at the end and see if they are soft enough (although with carrots, I doubt they will be). Hi! 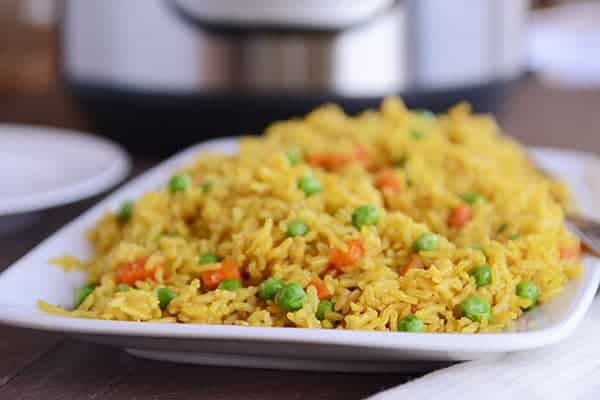 When you add the peas at the end, are you adding frozen peas to the cooked rice then? Could I use vegetable broth instead, or does the chicken broth give it some of the flavor? Sure, I think you could use veggie broth. The flavor will change a little depending on the flavor profile of the broth, but it should work fine as long as you like the taste of the broth you use. Hey Jennifer! If you check out the link in the Recipe Source (below the recipe), it will take you to the original recipe which is a stovetop version! Fantastic and super easy in the multicooker. Instead of curry powder, I used 1 t each of fenugreek, cumin seed, coriander seed, mustard seed, 1/2 t cayenne, 1 T tumeric, and 4 green cardamom pods. Will make again and again! Hello !!! I just love all your recipes !!! Have only one problem , you don’t have all the nutritional facts so I can figure out my calorie intake !!! Hi, I have a sort of related to this recipe/sort of not question. Just wondering if you have ever cooked rice or quinoa in bulk in your instantpot, and if so, what are the max amounts? I am hosting this year’s family reunion (50+ people) and would love to be able to set and forget my rice/quinoa. Thanks for any help and thanks for sharing so many tasty recipes! The general rule of thumb is not to fill up a pressure cooker more than halfway (with both liquid and rice) if cooking rice or beans or any other food that can expand and foam. So a lot will depend on the size of your pressure cooker. Does that help at all? I bought an Instant Pot to try this recipe. It turned out great!! Love the recipe. Love the Instant Pot. I also made flavorful Moroccan Grilled Chicken Kabobs to go with it and some Naan bread. It was the perfect compliment with the rice! You might like this recipe. Marinate the chicken in the mixture of the remaining ingredients for at least 20 minutes to overnight. Do you think I could use this recipe in my rice cooker instead? I have yet to get me an Instapot! I don’t see why not! But I haven’t used a rice cooker in a LONG time, so I can’t offer any firsthand advice. I know this comment is a little old, but I make this in my rice cooker all the time! Just sauté the initial ingredients in a saucepan and then put everything in the rice cooker. If you use the basmati rice should you adjust the cooking time for less than 22 min? I want to try this recipe this week! Thanks for all the heart you put into your blog. I’m a faithful follower! Hi Robyn – are you talking about white basmati rice? If so, yes, I’d only cook it for 4 minutes or so. But for all brown rice varieties, the 22 minutes should work. In case anyone else is wondering like I was, I made this with jasmine rice and it turned out great. I changed the cooking time to 4 min high pressure and then 10 min NPR. Super yummy and easy. I will definitely make it again. Thanks Mel! I made this on the stovetop as I do not have any type of pressure cooker (although that may be changing soon!). The taste was delicious, but if anyone else is thinking of trying this on the stove–I had to add a lot more liquid (I’m guessing at least 1 1/2 cups) and the rice was still a bit hard. Brown rice in my IP is beloved. Never thought to pressure cook rice with my previous pressure cooker that died. I have a recipe for Mexican Rice that I think is way better in a Dutch oven in the oven than in the stove top. I am going to get brave and use the recipe in the IP and see if everyone still raves!! That would be especially good in the summer when I don’t want the oven on for two hours. I posted the above recipe on FB and I’m going to try it this week. I think I might add some shredded cabbage with the other vegetables. I think lots of rice dishes and soup need cabbage. If you use the Julienne on your mandoline slicer, no one will even see it after it is cooked. For years with Fried Rice, I did the small julienne because my kids were convinced they hated cabbage. I was glad to see you added the peas at the end just to warm them. I’d like to make this today but only have non-low sodium broth. If I just omit the kosher salt will I still be in the ball park? Sure…and actually, I usually season to taste with salt at the end, so you may be fine with regular broth and the salt, but it is probably safest to cut back on the salt and season at the end. Just wondering…if I grab some Penzey’s sweet curry powder – are there any other Penzey’s spices that you love or I will see in your recipes? Easier to grab everything at once! Thanks! Hey Cheryl – this is kind of my standing order for Penzeys: sweet curry powder, cinnamon (their signature blend; my favorite cinnamon! ), mexican oregano, california basil, sandwich sprinkle (we use this on the outside of grilled cheese or paninis, on vegetables, on garlic bread), smoked paprika, black pepper blend, cumin, and probably a few others, but that’s all the ones coming to my mind right now. I have little jars that I refill, so I buy the spices in their larger bags which is more cost effective. First I have to say that I don’t like curry! But there was something about this recipe that kept me coming back to it and debating whether or not to give curry another try. It could be that it was made in the IP or just how simple it was or that it healthy. I’m going to say it was a little of all of them. Well I made it tonight and I have to say WOW!!! This will definitely be a regular on my meal plan. I do have to cook my brown rice for longer as it still had a bit to it. This best part of it was watching my toothless 9 1/2 month old eat this like there was no tomorrow!!! Thanks for another fantastic recipe. Your comment made my day, Abbie! So happy this was a hit at your house (curry lover or not!). Delicious! I added a chopped sweet potato along with the carrot and at the end some chopped kale and pea shoots. Loved this recipe! I added chicken to make it a meal and it was delicious. Definitely doubling it next time. Thanks, TJ! Glad you liked this! Mel. I never leave reviews or comments but had to after trying this recipe. It was amazing. I happened to have everything on hand and dumped it into the Instant Pot and had an incredibly delicious lunch. Thank you, thank you for posting this today! I was wondering if this would cook as well in the oven? I use your method for brown rice in the oven all the time and I’m curious if the results would be the same. I’d like to share this recipe with my friends who don’t own a electric pressure cooker. Thank you, Michelle! I’m so happy you tried this and loved it! Yes, I think you could totally convert this to the oven. This looks so yummy!!! I wonder how it would be with saffron? Thanks, Mel! This was a hit at my house tonight! I also threw in frozen shredded chicken I found in my freezer and made it a complete meal! Incredibly fast and easy, this will be a regular at our house. Love the complete meal factor of this, Melissa!! I love your Instant Pot recipes. You are definitely inspiring me to purchase one for my apartment!! I think you’ll love it, Angelina! Do you teach your own kids piano lessons? I teach mine and some people tell me I’m crazy, that it’s too much tension between Mom and kids. I want them to learn to play the piano and think it’s crazy to pay someone else to teach them something I can do for free! It’s definitely not smooth and peachy everyday, but I’m glad we do it. Also, I made your carrot cake for Easter and wow! It was such a hit. Several people told me they didn’t think they liked carrot cake until they had that one. Thanks for making me always feel like a rock star in the kitchen! What you’ve described sounds a lot like our house! I teach my two boys for now (11 and 8), but I think I’m going to start teaching my girl soon. She’s 5 and in preschool. She knows her letters so hopefully that will be enough. Guess I’ll find out soon enough! Can I suggest Hoffman Academy? They offer free online piano lessons. My boys (9 and 6) really enjoy the lessons, and I think he does a great job teaching. It makes my job easier, as I really only have to reinforce what they have already learned. We now pay for a membership, but we started out and learned a lot with the free stuff. I just wanted to say…Easter dinner was superb thanks to your recipes! Thanks for making my life so easy and my family thinking I’m an awesome cook! I think it’s safe to say we have all felt like failures and have self doubt. My husband often tells me that I over analyze things WAY too much. I really appreciate your genuine approach to parenting, cooking, and life in general! I have made so many positive tweaks in my life since following your blog. Thanks for giving so much of your time to helping me (and countless others) feel like a success! That is so true, Bridget – I know I’m certainly not alone in those feelings. And I join you in the overanalyzing camp. 🙂 Thanks for your kindness. Silly question as it has been a long day. Is the heat from the finished dish enough to cook the frozen peas? Or did I miss a step? Yes, if the peas are stirred in right away, the piping hot temperature of the rice thaws and warms the peas. This looks delicious and I love it when you share instant pot recipes! Ah, sure miss your family, Judy! This looks so delicious! I need this in my life! Every time you post an instant pot recipe I do a little happy dance. I use mine several times a week now, and I owe it all to you !!! This rice looks perfect …. We love rice of every variety at our house. Any suggestions for a yummy way to do Spanish rice in the IP? I’ve tried a couple … But nothing I’ve totally fallen in love with. 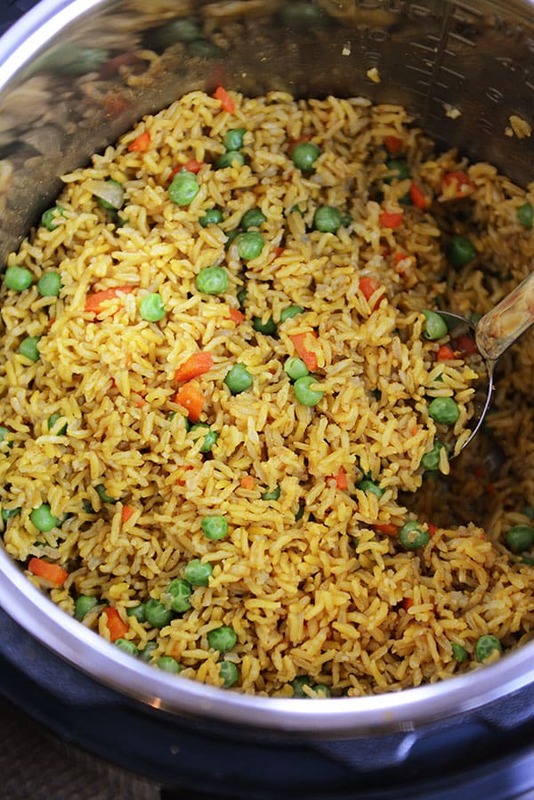 I haven’t perfected a Spanish rice version…but I have one that’s pretty close! I’ll post it soon (and if not, I’ll email it to you!). Thanks .. That would be wonderful!! Even after too little sleep, constant squabbles, and not getting my to do list done, I still have to feed their and my bodies. Thanks for just being you and giving us real, edible food that I cook again and again. I was given a used rice cooker and I’m wondering, can things like this be cooked in a rice cooker? I’m not experienced with rice cookers and I don’t have an Instant Pot-though it’s on my list of things I’d like to get one fine day! I cook the original recipe from weelicious (linked at the end of this recipe) in my rice cooker all the time! Mel, do you have an instant pot cookbook or blog that you really have success with? I make something similar to this on the stove top. For each cup of rice I cook, I add one garlic clove and about 1/2 cup each of diced onion, carrot and red bell pepper plus some salt. When the rice is done cooking, I add 1/2 cup frozen peas, fluff the rice and let it stand for 5 minutes. The seasoning varies depending on how I plan to serve it. I also have a random Instant Pot related question for you. I’m getting married soon, and my fiancé and I are also moving to New York City. This means we will have a tiny apartment with not a lot of storage space. Would you recommend the Instant Pot as a good multi-purpose alternative to a regular slow cooker? I will mostly just be cooking for the two of us, and while I’d love to register for both appliances, I just don’t think it’s practical. Thank you so much for all of your wonderful recipes! Hi Megan – great question, and if given the choice between a slow cooker and Instant Pot, I’d definitely go with the Instant Pot. It’s versatility outweighs the slow cooker, and I find that personally I’m turning to my IP more than my slow cooker these days (plus the IP has a slow cooker function, too). Congrats on your upcoming wedding! These are the reasons we love you, Mel! Amid the “insecure and doubtful and failure-ish,” you get dinner on the table, and give us hope that we can too! This needs to be my Mother’s Day gift though a spa day would prob suffice. Lol I hope you have a better week with less “fails”.